A body of water in Tanzania has the ability to kill off numerous animals yet provide a breeding ground for others like flamingos. 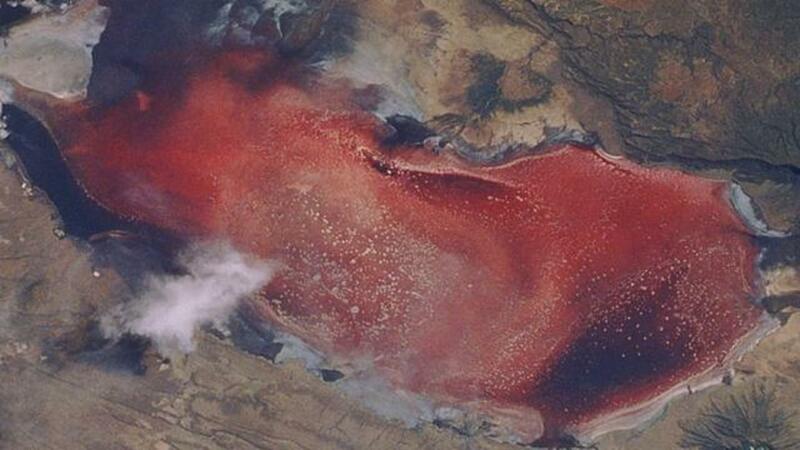 It's called Lake Natron, and, according to a recent Smithsonian.com article, it is known for its hot temperatures (140 degrees Fahrenheit) and highly corrosive contents. Prior volcanic activity and nearby hot springs have caused the water to be extremely salty with an alkaline pH level of 9 to 10.5. As the Smithsonian piece states, the liquid can "calcify...remains, strip ink off printed materials and burn the skin and eyes of unadapted animals." Nevertheless, Lake Natron remains a primary mating site for more than a million lesser flamingos, according to the NBC News. Their thickly covered legs enable them to endure the harshness, and once the water reaches a certain level, the birds build their nests on little islands that appear while staying protected from predators.